Mrs. Garey’s gym class got their week off to a great start on Monday, getting a Wine & Gold visit from Cavs Academy, the official youth sports program of the Cleveland Cavaliers. Cavs in-arena host Ahmaad and members of the Scream Team joined Cavs Academy coaches at St. Barnabas School in Northfield for a special “gym class takeover” as part of the Cavs “Fit as a Pro” program, presented by Medical Mutual and in association with Giant Eagle. Coach Jon, Coach Jess and Coach Kendall talked to the students about the importance of C-A-V-S: Commitment, Attitude, Voices and Sportsmanship. They spoke to the kids about the value of each characteristic and ways to embody them both on and off the court. Students had the chance to act out how they would apply each element in their everyday lives. 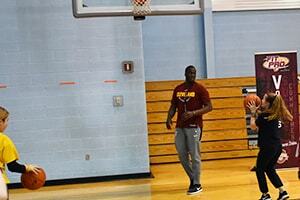 Of course no Cavs visit would be complete without some hooping. The class was led through stations by the coaches and Scream Team members, where they worked on ball handling, shooting, passing and fitness. In order to make sure to leave a lasting impression on the class and the whole school, the Cavs coaches and entertainers presented the group with brand new gym class equipment: one dozen basketballs and two dozen jump ropes, stretch bands and hula hoops! Each of the students at the gym class takeover also received a Cavs swag bag to take home with them. Fit As A Pro is year-round campaign designed to encourage physical fitness and well-balanced nutrition among elementary and middle school students in Northeast Ohio. The program reaches thousands of students in Northeast Ohio through fitness challenges, nutrition education and information on how to maintain an overall healthy lifestyle.